Maintenance For Micro Ring Hair Extensions! Your micro ring hair extensions (also called micro link hair extensions, micro loop hair extensions and micro bead hair extensions) can last for several months. How long they last is in part down to how they are treated or rather, how you maintain them. Whilst the appeal of micro ring extensions is that they are part of the group of extensions that don’t require glue or heat to be fitted, they do require extra time to be cared for properly. The fact of the matter is, if you choose micro loop hair extensions you have to be prepared to spend a little extra time styling and washing your micro link hair extensions. Heat styling micro link hair extensions should also be kept to a minimum and done with the use of thermal protection serums. Let’s face it, if you’ve spent all that time and money getting micro ring extensions, then it’s worth spending the extra time to make sure you prolong their use; look after your hair extensions and they’ll make you look good. How long do micro ring hair extensions last? If you’re using micro ring hair extensions then they can last anything up to 14 weeks. As hair grows about a centimetre a month hair can look quite clumpy by that time so you may want to remove them sooner rather than later – 8 – 10 weeks is optimum. How long your micro loop hair extensions last has a lot to do with how they are maintained, including washing and drying the hair extensions, as well as combing the micro loop hair extensions. Who Can Wear Micro Ring Extensions? Micro bead hair extensions are great for adding length and volume; but because they are attached to hair by a small ring, they're not suitable for those who want to add fullness to areas where the hair is thinning or who want to cover areas without any hair. In these circumstance an alternative hair replacement product like weave hair, a lace frontal piece or micro ring weft hair may may be a better option for you. It's possible for people with very curly hair to use them, however getting an identical match for texture can be difficult as curly hair comes in many guises. If you have natural type 4 Afro hair and the hair has not been chemically treated to be straight or have looser curls, this type of hair extension might not be ideal, but if you’re Afro textured hair has been straight permed or relaxed then micro ring extensions will be easier to remove. All of this goes to say that if there's enough growth hair for attachment and matching hair textures, then micro ring extensions can be worn by anyone and the there are straight micro link hair extension textures as well as wavy micro link hair extensions and curly texture micro ring hair extensions. When you first have your micro ring hair extensions attached, it’s normal for there to be some discomfort (not pain) in the first few days as you have added weight to your hair, which as you know is attached to your scalp. The micro rings should not be fitted tightly at the roots so it’s not a question of your natural hair being pulled, just the adjustment to the additional weight for each of the hair extensions. Your scalp may feel tender and this may cause a mild headache – in some instances the extra weight can cause your scalp to itch, but any discomfort should dissipate over the first few days of the hair extensions being attached. Can Micro Rings Be Seen? The micro ring extensions are applied very close to the scalp so providing you have enough growth hair surround the area, they will not be visible to someone standing next to you. As well as this, the rings come in all colours so using the ring colour closes to your hair colour will further help conceal them… Nifty! Can You Go Swimming With Micro Ring Hair Extensions? Yes you can. In fact you can participate in any kind of sport with micro ring extensions as the clamped ring holds has a firm hold on the growth hair so aren’t prone to slipping out. However, it's important that you follow the advice about swimming with micro link hair extensions and always wash your micro ring extensions after swimming (whether in a chlorinated pool or in open water). Can You Wash Your Hair With Micro Rings Hair Extensions? You certainly can wash your micro ring extensions and the fact is you should wash them. If you're not sure how to wash micro loop hair extensions, why not check out our step by step guides to washing your micro ring extensions. Micro link hair extensions should never be washed within the first 48 hours of being fitted and ideally micro ring extensions should not be washed more than twice a week - be sure to rinse out all the shampoo and conditioner you use. Micro ring extensions should never be left wet and can find out how to safely dry micro ring extensions here. Ideally you should tie your natural hair along with your micro braid hair extensions back into a loose ponytail when you sleep. If you want to wear a satin bonnet (we know, delightfully old fashioned but actually really beneficial), then go ahead. If your happy with mild waves then loosely plait (braid) the hair extensions - this will also prevent tangling, but you'd rather avoid waves in the morning, then wrap the hair extensions (with the satin bonnet) so that it doesn't become tangled overnight. 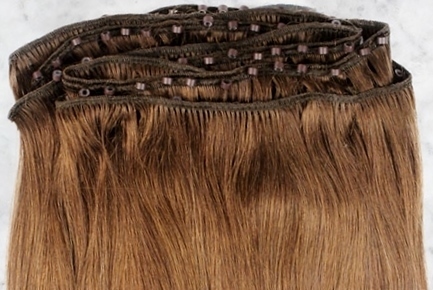 Well you can check out our Human Hair Extensions vs. Synthetic Hair Extensions pages for the pros and cons of each but for many, the sure winner with micro rings has to be human hair just for the ability to straighten or curl it using heat. The choice of course is up to you! There's more information in the Hair Extensions Q&A section or if you'd like to keep up to date with the next guide about hair weave, hair extensions, wigs and hairpieces then join our blog.